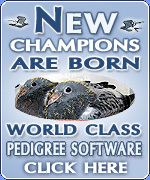 Pigeon Loft Orginzer now available to purchase online. THE ONLINE AUCTION SITE... Elimar operates on a NO SALE NO FEE basis. From 1st January 2018, our charges will be 17% of any sale price - providing you add the birds to the site yourself. Or if you would like Elimar staff to upload them, we will charge 22% of the sale price; there is a minimum £10 charge per pigeon sold. If you want any guidance on how to upload photos and details, contact elimar908@btinternet.com and we will take you through the process. Payment for purchases is easy - all you need to do is click on the PAY ELIMAR button and pay direct. It's simple and immediate. VAT Registration Number: 284 0522 13..